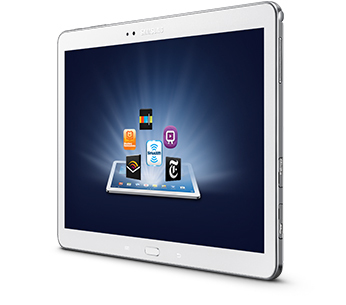 Samsung Galaxy Note 2014 Edition - 10.1" - 16GB: This sleek, stylish tablet comes with a 10.1" Full HD touch screen to display movies, Web sites and more with impressive visual fidelity. The included S Pen is pressure sensitive and allows you to draw, write, edit and more as easily as if you were using a real pen. 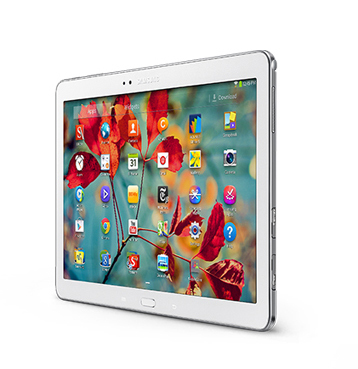 The ultra-sleek Galaxy Note® 10.1 2014 Edition has more than four million pixels – 2M more than HDTV. And with a pixel density of 299 PPI, colors are rendered much brighter and everything’s lifelike and clearer. Combined with Virtual Dolby® 5.1 Surround Sound, an incredible cinematic experience is available wherever you go, even if you go outside. 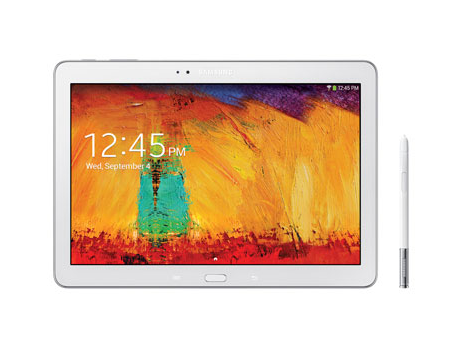 The Galaxy Note® 10.1 has an unrivaled outdoor luminance of 400 nit. The enhanced S Pen™ offers more ways to get things done than ever before. Jot down phone numbers, contact info, even text messages and Samsung’s handwriting-to-text engine automatically converts your notes to text. Save time by hovering S Pen over the screen and pressing the button on the side to bring up the Air Command menu. It gives you quick, easy access to incredibly helpful functions. Stream all your favorite movies and shows on the ultra vivid display, that also doubles as an e-reader for your books, magazines, newspapers and other content. And find all the popular apps such as Instagram, Pinterest and Facebook, as well as other apps designed specifically for use with the S Pen at the Google Play™ Store. 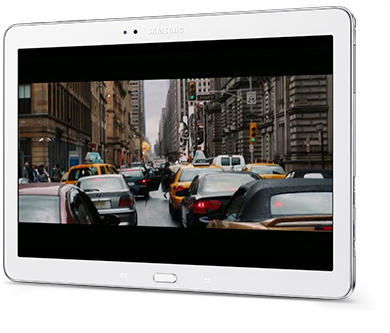 You can also use Galaxy Note 10.1 as a universal remote and TV guide with Samsung’s WatchON™ app. 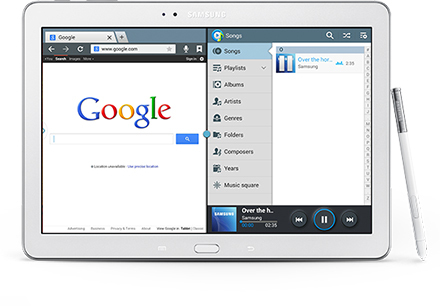 Make the most out of the big screen with Samsung’s Multi Window* feature. Multi Window gives you the power to use multiple apps side by side, or drag content from one app to the other-you can even open the same app in both windows. This is especially useful when you’re referencing two different websites or writing two emails at the same time. 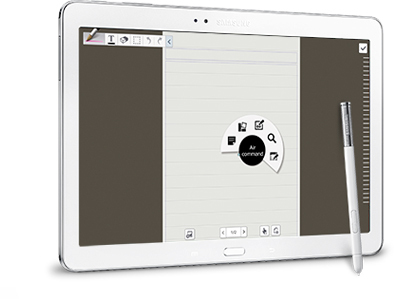 Edit Word documents, PowerPoint presentations and Excel spreadsheets – and annotate PDFs – right from Polaris Office on the Galaxy Note 10.1. Also, with Group Play, you can share your presentation or photos and collaborate in real time with other nearby Group Play users on the same Wi-Fi network.